Texas is one of the United States Central Southwest states. It borders Mexico on the southwest and the Gulf of Mexico on the southeast. To the west is New Mexico, to the north and northeast lie Oklahoma and Arkansas, and Louisiana bounds Texas on the east. Austin, is the capital of Texas. Houston is the largest city. 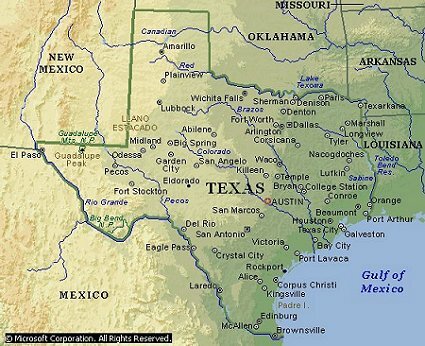 Texas is the size of Ohio, Indiana, and all the New England and Middle Atlantic states combined, and its vast area encompasses forests, mountains, deserts and dry plains, and a long, humid, subtropical coastal lowland. Texas's wealth of mineral resources is almost unequaled among the other states. Its rapid economic development stimulated by these resources and its vast size have made Texas an American legend. Oil wells, chemicals, ranches, and cattle have played a major part in that legend. For more than 100 years, Texas was part of the Spanish Empire in America. 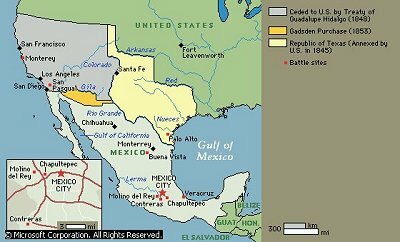 When Mexico gained its independence from Spain in 1821, Texas was for a while joined to Mexico. The section from San Antonio southward retains the flavor of the Hispano-Mexican period in its architecture, foods, and festivals. Texas was an independent republic until it joined the Union on December 29, 1845, as the 28th state. Its single-star flag dates from its independent period and has given Texas the nickname the Lone Star State. Texas can be divided into four natural regions, or physiographic provinces: the Gulf Coastal Plain, the Central Lowland, the Basin and Range province, and the Great Plains. The Gulf Coastal Plain, a subdivision of the Coastal Plain, makes up most of eastern and southern Texas and occupies more than one-third of the state. Near the coast this region is mostly flat and low-lying. It rises gradually to 300 m (1,000 ft) farther inland, where the land becomes more rolling. Belts of low hills cross the Gulf Coastal Plain in many areas. In these higher areas the stream valleys are deeper and sharper than those along the coast. The Central Lowland, a subdivision of the Interior Plains, occupies much of north-central Texas. The section of the Central Lowland in Texas is known as the Osage Plains. The land in this region has elevations ranging from 500 ft in the east to 2,600 ft on the western edge. Several belts of low hills cross the Central Lowland, running in a north-to-south direction. The Basin and Range province, a subdivision of the Intermontane Plateaus, lies to the west of the Great Plains in the extreme western part of Texas. Running through the central part of this region are several rugged mountain ranges. Between the mountain ridges and to the west of them are high dry basins or plateaus. The Basin and Range province in Texas is divided into two sections, the Mexican Highland and the Sacramento section. The Sacramento section has more extensive plateaus than the Mexican Highland, and contains the highest point in Texas, Guadalupe Peak, at 8,749 ft above sea level. The Great Plains, also a subdivision of the Interior Plains, extends over most of northern and central Texas. The part of the Great Plains that occupies northern Texas, or the Panhandle, is called the High Plains. Another name for this area is Llano Estacado, or Staked Plain. The elevation of the High Plains ranges from 2,500 ft to more than 4,000 ft. The land is flat, except for a few eroded river valleys. The southern part of the Great Plains in Texas can be divided into the Edwards Plateau and the Central Texas section. The Edwards Plateau is generally level and differs from the rest of the Great Plains in that it is underlaid with hard limestone, rather than with softer and more porous rock. The Central Texas section, which is hillier and rockier than the rest of the Great Plains in Texas, is often called the Hill Country. The eastern edge of the Edwards Plateau and of the Central Texas section is marked by the long ridge known as the Balcones Escarpment. It divides these regions from the lower Gulf Coastal Plain. Two small subdivisions of the Great Plains are seen in Texas, the Pecos Valley in the southwest and the Plains Border in the northeastern corner of the Panhandle. 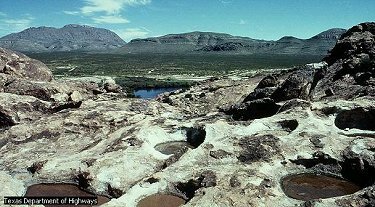 The Pecos Valley is mostly flat and rocky. The Plains Border is level or gently rolling. Texas is the second largest state in the nation, after Alaska, and has an area of 267,277 sq mi, including 4,959 sq mi of inland water and 404 sq mi of coastal water over which it has jurisdiction. Extending for 770 miles from east to west and for 800 miles from north to south, the state comprises 7 percent of the land area of the United States. 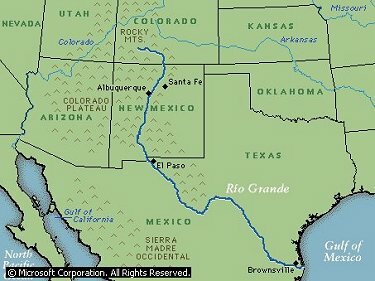 The mean elevation is 1,700 ft.
Texas's largest river is the Río Grande, which flows southeastward for 1,300 miles along the border between Texas and Mexico. The Río Grande carries little water during most of the year, but floods occur after periods of heavy rain. The principal rivers that flow across the central part of the state from the Great Plains or Central Lowland to the Gulf of Mexico are the Colorado, the Trinity, and Brazos rivers. The Colorado River is particularly important because it has been dammed to form several large artificial lakes. Two other large rivers are the Red River, which forms most of the boundary between Texas and Oklahoma, and the Sabine River, which marks part of the border between Texas and Louisiana. Shorter rivers that flow across the Gulf Coastal Plain include the Nueces, the San Antonio, the Guadalupe, the Lavaca, and the San Jacinto. Most of the large lakes in Texas have been formed by dams. Among the largest natural lakes in the state is Caddo Lake, along the Louisiana border. Caddo Lake is not a single open body of water, but a winding network of channels and inlets. Large artificial lakes include Lake Texoma, on the Red River; Toledo Bend Reservoir, on the Sabine River; and Sam Rayburn Reservoir, on a tributary of the Neches River. Texas has a coastline of 367 miles along the Gulf of Mexico. However, long narrow islands called barrier islands extend along most of the coast; if the shoreline of all the islands and bays is taken into account, the coastline is 3,359 miles long. Between most of the barrier islands and the mainland are shallow lagoons. The largest island along the coast is dune-filled Padre Island , most of which has been made a National Seashore. Climate Eastern Texas has a humid subtropical climate, while a semiarid low latitude climate prevails in central areas, and an arid low latitude climate in the extreme west. Along the coast the climate is much milder, with fewer extremes in temperatures. Hurricanes sometimes hit the coastal areas of Texas from late July through September, and tornadoes are common in north-central Texas in April and May. Summers are hot throughout the state, and temperatures exceeding 95° F are relatively common. Average July temperatures range from 82° to 86° F over most of Texas. Winters are generally mild, except in the extreme northern parts of the state. The coldest winter weather is brought by north winds, called northers, that sweep down the Great Plains. The winds get warmer as they pass over the state, however, and by the time they reach the coast, temperatures are generally above freezing. Average January temperatures range from 60° F in the extreme south to 34° F in the northern Panhandle. Precipitation in Texas decreases steadily from east to west. Along the Texas-Louisiana border almost 55 inches of rain falls each year. The central part of the state has 25 inches of precipitation, and the extreme western part of the state has less than 10 inches. Rainfall is generally greatest during the summer. Snow is fairly uncommon in Texas, except in the higher mountains and in the High Plains. The growing season, or the period between the last killing frost in spring and the first killing frost in fall, ranges from 320 days along the coast to 180 days in the Panhandle. In most of the state the first killing frost in fall comes in about the middle of November and the last hard frost in spring occurs toward the end of March. Much of eastern Texas and the Gulf Coastal Plain has red and yellow soils that are mostly sandy and reasonably productive with the proper use of fertilizers. Parts of the Gulf Coastal Plain and central Texas section have soils based on weathered decayed limestone. This limestone, with its thick cover of native grasses, has formed a rich, nearly black soil. It is one of the best types of farming soil in Texas, although it becomes hard when dry. When wet, it becomes gummy and difficult to plow. Many of the soils of southern Texas are rich, especially along the lower Río Grande, which has fertile alluvial soils. However, the soils in this area are often not productive because of scanty rainfall. Most of the High Plains has rich reddish-chestnut soils that are productive with adequate water. Farther south, the Edwards Plateau has thin, poor soils. Most of the land in this area is used for grazing livestock. The Basin and Range province has some fertile alluvial soils in the river valleys of the Pecos and the Río Grande. In most other parts of the area the soil is too salty for farming. Texas's vegetation changes gradually from east to west as the climate becomes more arid. Forests cover just 9 percent of the state's land area. Eastern Texas has forests largely made up of loblolly pines and shortleaf pines. The undergrowth of these forests usually includes several types of ferns. West of the pinewoods is an area of mixed pine and hardwood forests called the post oak belt. Several kinds of oaks, as well as sweetgums, hickories, and elms, grow there. Farther west the forests are thinner and the trees smaller. Mistletoe, a parasitic plant, often grows on the trees of this region. Much of central Texas is grassland, with thickets of junipers known as "cedar breaks." Southern Texas and parts of the Great Plains are mainly grasslands, with clumps of mesquite trees. The mesquite is highly efficient in extracting water and minerals from the soil and therefore grows well in arid climates. The most common grasses are the big bluestem, found in the less arid regions, and the little bluestem. Some parts of western Texas have desert vegetation. The plants in this region generally have few leaves and flower only in moist seasons. They send their roots far into the earth to gather as much water as possible. Some, such as the cacti, have thick spongy tissues that store water. The higher elevations of western Texas have some fir and pine trees. The fields and roadsides of central Texas have many colorful wildflowers, especially in late spring. Among the most notable wildflowers are the bluebonnet, which is the state flower; the Indian paintbrush; and the prickly pear, a type of cactus that is common in dry areas and that bears large yellow flowers on the edges of its thorny leaves. GAnimal Life Texas's wild animals have been greatly reduced in number by settlement and by extensive hunting and trapping. The white-tailed deer is by far the most important game animal. There are also many coyotes, which live mostly in the rough country of southwestern Texas. Other large animals still occasionally found include pronghorn antelope, cougar, and black bear. Smaller animals include the rabbit, squirrel, skunk, and raccoon. The prairie dog, a rodent that once existed in huge colonies on the prairies, has become relatively scarce. Two unusual Texas animals are the nine-banded armadillo, a small slow-moving creature with a scaly shell-like skin, and the peccary, or javelina, which resembles a small pig. Texas has a variety of reptiles. Probably the best known is the western diamondback rattlesnake, one of the most dangerous poisonous snakes. Other poisonous snakes in Texas include the coral snake, the copperhead, and the cottonmouth. There are more than 85 species of nonpoisonous snakes in the state. Many alligators live in the lakes, rivers, and bayous of eastern and coastal Texas, and there are several kinds of turtles. Small reptiles include a variety of lizards, notably the horned lizard. Texas's birdlife is the most varied of any state. Among the best-known birds that live in Texas all year is the mockingbird, which is the state bird. Jays, wrens, woodpeckers, sparrows, and titmice are common in the eastern and central parts of Texas. Among the large migratory birds that winter in Texas, especially around the lakes and lagoons of the Gulf Coast, are many species of ducks and geese, as well as the nearly extinct whooping crane, a great white bird that stands about 5 ft tall and whose numbers are slowly recovering through rigid protection. Birds found in the interior of Texas include the wild turkey and the roadrunner. A few golden eagles live in the mountains of the Basin and Range province. Fish are plentiful in the waters off the Texas coast. Commercial marine catch includes shrimp, crab, oyster, snapper, flounder, and drumfish. Among the most popular saltwater game fish are the tarpon and sea-trout. Of the freshwater fish caught in Texas the most common are catfish, bass, and sunfish. Texas's most serious environmental problem is the establishment of an adequate supply of water. More than 200 reservoirs are maintained for water supply, recreation, flood control, and irrigation. Underground water supplies are also widely used for irrigation. Soil conservation and the protection of Texas's wildlife are also of primary concern. There are state organizations, notably Texas Parks and Wildlife Department, as well as federal agencies involved in Texas's conservation program. Soil conservation in the state is carried out by 212 soil conservation districts, which cover about 99 percent of the state's total land area. Among the various soil conservation projects are the reseeding of grasses and rangelands to control wind and water erosion, the terracing of croplands in hilly areas, and the rotation of crops in areas where the fertility of the soil has been impaired by extensive growing of a single crop. The Texas Natural Resource Conservation Commission is the major state agency involved in controlling environmental pollution. In 1998 the state had 32 hazardous waste sites on a national priority list for cleanup due to their severity or proximity to people. Progress was being made in efforts to reduce pollution; in the period 1988-1995 the amount of toxic chemicals discharged into the environment was reduced by 38 percent. Many recreational and scenic attractions are found in Texas. There are tall pine forests in the eastern part of the state, rugged mountains and colorful deserts in the southwest, and interesting historic landmarks in such cities as San Antonio. In about 350 places the Texas landscape has been altered with artificially created lakes. The lakes have greatly expanded the facilities for fishing and all kinds of other water sports. Hunting is a popular seasonal sport in all parts of Texas, particularly in the central and southern sections, where deer and other wildlife abound. Boating, bathing, and deep-sea fishing draw large numbers of visitors to the winter resorts along the lower Gulf Coast. Other winter vacation centers have been developed in the Lower Río Grande Valley between Brownsville and Mission. 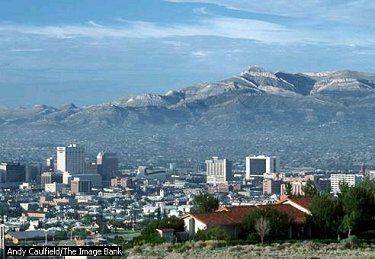 These cities are gateways to Mexico, as are Laredo, Del Rio, and El Paso. Noted for its rugged scenery and beautiful wild flowers, Big Bend National Park along the Río Grande, is a major tourist attraction. A relatively recent addition to the national park system is Padre Island, a barrier island 110 miles long and linked by causeway with Corpus Christi. About 80 miles of beach has been included in Padre Island National Seashore. 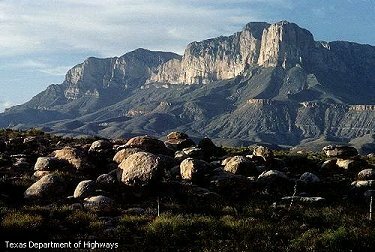 Another park is the Guadalupe Mountains National Park in the southwest. National recreation areas provide access to Amisdad Reservoir on the Río Grande and Lake Meredith on the Canadian River. The National Park Service administers several important historic sites in Texas. The San Antonio Missions National Historical Park preserves four Spanish missions built during the 18th century. An important post in the l9th-century defensive system of West Texas is contained in the Fort Davis National Historic Site. The Lyndon B. Johnson National Historical Park in Johnson City and Stonewall includes the birthplace, boyhood home, and ranch of Lyndon B. Johnson, the 36th U.S. President. Four national forests, Sabine, Davy Crockett, Sam Houston, and Angelina, all in eastern Texas, offer recreational facilities. Agencies of the federal government also administer a national preserve, five national grasslands, and 14 national wildlife refuges. Aransas-Matagorda Island National Wildlife Refuge, north of Rockport, is the winter home of the only flock of Canadian-nesting whooping cranes in the world. State Parks State-protected lands include more than 110 state parks and five state forests. Palo Duro State Park, one of the largest state parks, covers 15,000 acres in the High Plains. Water sports may be enjoyed at Caddo Lake, Atlanta, Possum Kingdom, Lake Whitney, and many other state parks, and bay fishing is available at Goose Island State Park. A number of state parks preserve the missions, forts, and historic buildings of Texas. In San Antonio is the famous mission-fortress known as the Alamo. Several historic sites associated with the Republic of Texas are included in Washington-on-the-Brazos State Park. East of Houston the San Jacinto Monument commemorates the defeat of the Mexican general Antonio López de Santa Anna in 1836, during the Texas Revolution. Other state historic parks include such sites as the Port Isabel Lighthouse; the Fannin Battleground, near Goliad; and the birthplace of President Dwight D. Eisenhower, in Denison. The large meteor crater near Odessa is one of the few known meteor sites in the United States. Once a prosperous mercury-mining town, Terlingua is one of Texas's ghost towns. The W. J. McDonald Observatory on Mount Locke is operated by the University of Texas. The earliest version of the rodeo is supposed to have taken place in Pecos in 1884. Most Texas events combine rodeos and barbecues with elements of the Spanish fiesta. These colorful events include Laredo's Washington Birthday Celebration, a ten-day fiesta celebrated jointly with residents across the border in Mexico; and Brownsville's costume festival, known as Charro Days, held during the week before Lent. Fiesta San Antonio spans ten days in late April. This major event includes art exhibitions, coronation of King Antonio, pilgrimage to the Alamo, concerts, band festivals, and three parades. Many Texas festivals are associated with livestock auctions and state fairs. More than 600,000 cattle move through Texas's largest livestock auction, in Amarillo. The State Fair of Texas, held in Dallas during the fall, draws more than three million people annually. Traditional fair exhibits include prize livestock and horse show performances, and a huge midway. Livestock events draw more crowds to the East Texas Fair in late September, in Tyler. Some annual events have a sports and recreation emphasis. A series of fishing competitions, including tarpon, billfish, and surf fishing tournaments, occupy Port Aransas from June to September. The July Hot Air Balloonfest in Mesquite attracts thousands of pilots and onlookers from all over the United States for the aircraft flyovers, parachute jumps, arts, crafts, and musical entertainment. The activities of Dallas's Cotton Bowl Week commence late in December and are climaxed by the New Year's Day football game. Other festivals in the state highlight the arts. The Houston International Festival each April celebrates the performing and visual arts with a ten-day outdoor festival of multicultural music, dance, arts and crafts, and food. Texas's dramatic scenery serves as the backdrop for outdoor drama in several cities. Galveston brings musicals to life at Galveston Island Outdoor Musicals; the spectacular Franklin Mountains are the backdrop for open-air McKelligon Canyon Amphitheater near El Paso. * Major league professional sports teams in Texas include the Houston Astros and Texas Rangers baseball teams; the Dallas Cowboys football team; the Dallas Mavericks, Houston Rockets, and San Antonio Spurs basketball teams; and the Dallas Stars hockey team. The Babe Didrikson Zaharias Memorial Museum, near Beaumont, honors Zaharias, a leading athlete of the first half of the 20th century. The Texas Sports Hall of Fame is in Waco.